Ramonat Scholar and JLPP intern Dan Snow delves into the curious history of one of the many hundreds of books listed in the 1840s Jesuit booktrade ledger that he and Brendan Courtois have been working on this year. On February 25th, Heinz Nauer from the University of Lucerne gave a talk on the international reach of the Benziger publishing house at KU Leuven. 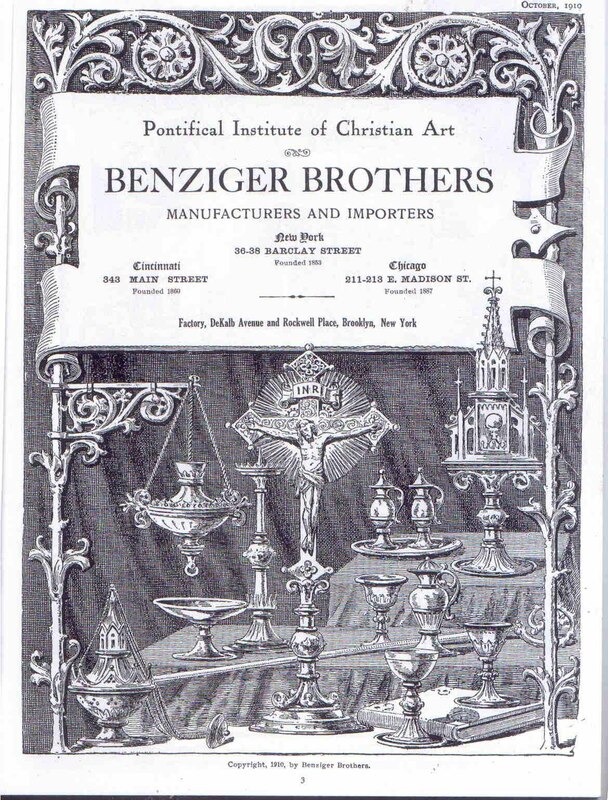 Benziger was one of the nineteenth-century’s major international Catholic publishing houses. It was based then in Einsiedeln, Switzerland (though they still operate today, they are based in Cincinnati). In our work with the 1840s St. Louis book trade ledger, we have encountered Benziger numerous times. In light of Mr. Nauer’s talk last week, I decided to look into the dealings the St. Louis Jesuits had with Benziger. From January 1843 to June 1849, the Jesuits placed seven orders with the firm. These sales are attributed in the ledger to Nicholas and Charles Benziger, sons of company’s founder Joseph Charles. Though there are not many orders throughout the ledger, each one is significant, often times taking many pages to cover and costing hundreds of dollars. The largest order was the first one, placed in January of 1843. This order took up nine pages of the ledger, and covered a huge amount of texts, most of which were in German (though some French and English texts can be found). While trying to compare this order to the books the Jesuits sold, one work in particular stood out. Only one copy of “Bibliothek vorz Predigten” was bought from Benziger in January 1843, making it easier to track its movement from the publishing company to the Jesuits and to whoever purchased it. The interesting thing about this specific book, however, is that it seems to have moved around quite a bit: the Jesuits marked it as returned when they first sold it, and then sold it again a few months later. Bought from Benziger as “Bibliothek vorz Predigten,” our book was likely Neue Bibliothek vorzüglicher Predigten des In- und Auslandes, a multi-volume collection of religious sermons (Copy on Google Books here). I’m not sure if the listed dates in the ledger are when orders were made, or when books arrived, but regardless, it took the Jesuits a few months to sell their new copy of the Bibliothek. Sell it they did, though, in March 1843 to a Rev. Mr. Dahmen, who is listed as working in a seminary. Fr. Francis Xavier Dahmen, C.M. was born March 23, 1789 in Düren, in the modern German state of North Rhine-Westphalia. He had fought in the Napoleonic Wars, and – perhaps seeking a respite from Europe – was sent as a missionary to the Mississippi Valley, arriving in Baltimore in July 1816. Traveling across land and by flatboat, Dahmen crisscrossed the US before reaching Bardstown, Kentucky in late 1816. Dahmen would first become a deacon, and then decided to become a Vincentian priest and received ordination on September 5, 1819. Dahmen spent the next few decades working as a priest for various parishes in the Mississippi Valley, including posts at Sainte Genevieve and Old Mines, Missouri. The ability to speak French, German, and some English made Dahmen a versatile priest in the St. Louis Diocese. He could tend both to French colonists who first dotted the region and to the influx of German settlers who came later in the 1830s and 1840s. With the appointment of Peter Richard Kenrick as coadjutor bishop in 1841, the diocese pushed for a new seminary closer to the city proper and separate from the Vincentian seminary in Perryville, Missouri. 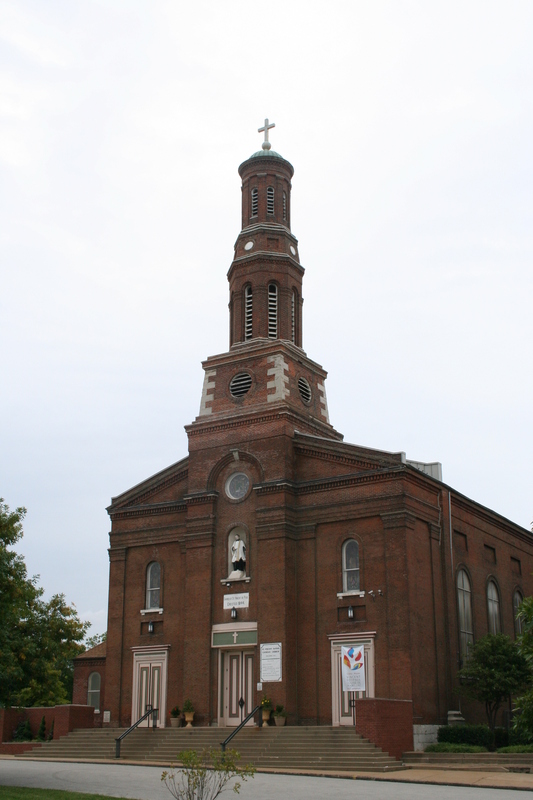 In a small building next to what would become St. Vincent’s Church in St. Louis, Kenrick established a separate diocesan seminary. However, the seminary shared the same lot that was designated for the new church of St. Vincent’s and the placement of Fr. Dahmen, C.M. as pastor of that church in 1845 ensured the Vincentians would play a heavy role in this seminary as well. This is where we would find Fr. Dahmen in 1843, serving the not-quite-finished St. Vincent’s Church and working at the seminary next door. This is where the Jesuits sent the book the Bibliothek that he ordered. However, the book soon found its way back to the Jesuits from the Vincentians. It did not move again for a few months. In May 1843, the Bibliothek was sent to another German priest, a Fr. G. H. Ostlangenberg (sometimes written as Ortlangenberg, sometimes with the names C.H., C.J., and sometimes as Caspar or Jasper). There is less information available on Father Ostlangenberg, but we do know that he served in the Mississippi Valley region during the late 1830s and into the 1840s. In the early 1830s he served at St. Stephen’s Church in Indian Creek, Missouri, and found himself in Saint Clair County, Illinois working at Shoal Creek and then St. Libory in the early 1840s. According to the Metropolitan Catholic Almanac and Laity’s Directory for 1844, Fr. Ostlangenberg was one of two priests working in the parish of St. Michael’s in Galena, IL. This is where the Benziger Bibliothek would end up, finally ending its trip across the Mississippi region. While there is much to be gained from a macro view of the book ledger, the story of the movement of this one text across Missouri is also valuable. It highlights the individuals who were actually using the books that the Jesuits ordered, and lends insight into the uses of these texts. Rather than just seeing the names of books and customers, we can use specific works like the Bibliothek to learn about formation of St. Vincent’s Parish in St. Louis and the seminary that Fr. Dahmen worked at, or the parish of Fr. Ostlangenberg in Galena. These figures speak to the varied character of the Mississippi Valley in the 1840s, and personalize a ledger that on the surface appears statistical and cold, but in reality contains a multitude of personalities and stories. By comparing the orders the Jesuits made and the sales they listed, countless stories like this could easily be drawn from the data of the ledger.